According to the latest reports from VR-Zone, the Intel Broadwell-K series processors for the desktop LGA 1150 platform would launch in Q4 2014. 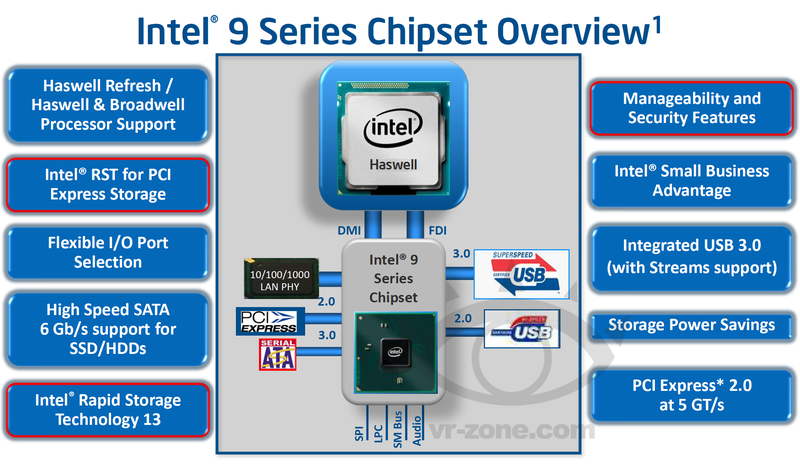 In addition to Broadwell, Intel would also release their Haswell refresh CPUs for the new platform which would be available early in Q2 2014. The Intel Broadwell-K series processors would be compatible with the LGA 1150 socketed motherboards which would feature the 9-Series Z97 Express chipset. As the name suggests, Intel would only launch K-Series unlocked processors based on the Broadwell architecture while the availability on non-K series remains a mystery for now. The Intel Broadwell-K series would be based on the new 14nm architecture while the Haswell Refresh processors would be based on the existing 22nm architecture with a few minor enhancements and clock speed increases. The Intel Z97 Chipset for high-end enthusiasts and H97 for mainstream consumers would bring with them the latest SATA Express support which would bring industry leading I/O storage performance with transfer speeds rated upto 10 – 16 Gb/s. Current motherboards come with SATA III transfer ports which deliver only 6 Gb/s ports so we would essentially be looking at faster transfer speeds and additionally blistering fast 10 Gb/s SSD solutions since the upcoming motherboards would be able to fully support them. The Z97 and H97 chipset would also feature support for Intel device protection with boot guard to protect PCs from malware attacks and new Intel Smart response and Rapid start technologies with Dynamic Cache sharing. However, the biggest change in the new platform would be the new power supply ratings imposed within it to support the Intel Broadwell-K series processors. So while the processor remains compatible to the same socket, it will not however remain compatible with the same chipset. This means that users would have to upgrade to a motherboard with the new Z97 chipset to fully support the Broadwell K-Series CPUs. For Intel Broadwell-K Series, users require V_PROC_IO connection with a 1.05V power source, VCCST Power supply and a new THRMTRIP. In addition to the Broadwell and Haswell Refresh processors, Intel will also introduce their HEDT Haswell-E platform next year featuring DDR4 memory support and upto eight cores based on the Haswell architecture. More information on those here.